to honor, remember and understand this tumultuous time. Meeting Space: Join us in Room 214-15 of Concordia University’s Library Technology Center (LTC). Please see link to campus map below. The LTC is building 19. Signage will be posted on-site. Parking: Free parking and direct access to the Center is available in Lot B on the east side of Hamline Ave. Additional free parking is available across Hamline Ave in Lots E & H.
April 18, 5 PM • War, Memory & Healing: A Community Conversation and Book Celebration with author Chia Youyee Vang, former Hmong pilots, officers, and others. May 20, 7PM • The Minnesota Connection to the Battle of Soui Tre. In 1966 a significant number of Minnesota men entered the army together, trained together, deployed to Vietnam together, were assigned together in units of the 25th and 4th Infantry Divisions, and found themselves fighting together in the bloody Battle of Soui Tre in March of 1967. The Fire Support Base at Soui Tre was commanded by then Lieutenant Colonel Jack Vessey, a Minnesotan, who received the nation’s second highest award for valor at Soui Tre and went on to become the Chairman of the Joint Chiefs of Staff, the nation’s highest ranking military officer during the Reagan Administration. Major General Rick Nash, the recently retired Adjutant General of the Minnesota National Guard, will give a brief overview of his extensive knowledge of General Vessey’s leadership skills. Retired Army Chaplain Colonel John Morris will give an overview of the battle based on his research for the book he is writing on General Vessey, and numerous veterans of Soui Tre will discuss their varied participation in the battle. August 28, 7PM | 1968 Democratic National Convention. Fifty years ago the world watched as the Vietnam War raged and protests rocked the 1968 Democratic National Convention in Chicago (Aug 26-29, 1968). To commemorate this anniversary, Edward Schwartzbauer shared his perspective from the convention floor, as did Bruce Richardson from Ft Bragg, at the first free public Vietnam War Round Table discussion, hosted by Concordia University, St Paul on Tuesday, August 28 at 7 P.M.
An early McCarthy supporter, Mr. Schwartzbauer’s story stretches from Grant Park to the Hilton Hotel to the convention floor. After the tumultuous convention, he spoke out publicly in support of Hubert Humphrey as the Democratic nominee drawing the attention of Senator Walter Mondale and the Vice President himself. Now a half century later, Edward holds dear a personal letter of appreciation from Humphrey dated October 11, 1968. This program, a collaboration between Twin Cities Public Television, the Minnesota Military Museum, and Concordia University, served as a preview to the 2018-2019 Vietnam War Round Table. In addition to Mr Schwartzbauer and Mr. Richardson, Concordia Professor Dr. Paul Hillmer provided a historical context for the Chicago convention and museum director Randal Dietrich offered a preview of upcoming round table discussions to take place monthly through May. September 17, 7PM • Expressions of War. Thanks to those who joined us for a riveting evening of prose, poetry, and memoir by veteran members of the Madison-based Deadly Writers Patrol [DWP]. Doug Bradley (Vietnam 1970-71), Bruce Meredith (Vietnam 1970-71), and William Schuth (Iraq, 2004) talked about DWP and shared their stories and poetry, based on DWP’s core beliefs that writing can be a mirror reflecting the deepest corners of our psyches; express the reality of suffering; explore the possibility of healing; enable problem solving; and achieve a deeper understanding of our common humanity. 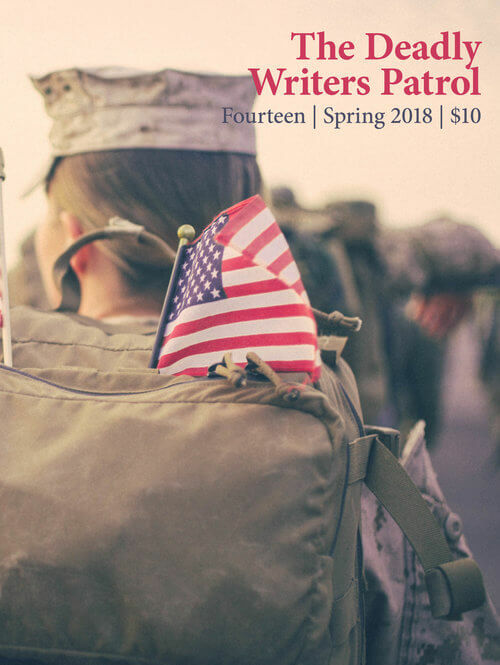 The Deadly Writers Patrol continues to engage new veterans on the path home, encouraging them to write so they can better understand themselves and their own experiences, and to help others better understand veterans and the burdens we carry home. October 15, 7PM • Native American Veterans and the Vietnam War. Vietnam veteran Doug Bekke and Ojibwe veteran, Rocky Tibbits, discussed Rocky’s reasons for entering the military, his service in Vietnam and in other locations, his return home from the service, and life since Vietnam. They also discussed attitudes toward veterans within their communities. A video interview with Lakota Vietnam veteran, Trudell Guerue, Jr. highlighted the heritage of service in his family, and how his service shaped his life after the war. Twin Cities Public Television also previewed their related documentary, The People’s Protectors, that premiered on Veterans Day- November 12th on TPT. November 19, 7PM • Stories from Veteran Voices Award Recipients. (ages 41 and older). The November Roundtable featured Hmong SGU veteran Xai Nou Vang and Vietnam veteran and combat artist, Les Fordahl, who opened up about their service during the Secret War in Laos and the Vietnam War. Veterans of the 1st and 3rd Marine Reconnaissance Battalions discussed how when and why they entered the Marines, how and why they were assigned to these elite units, their training and preparation for combat, and their small unit missions deep within enemy controlled territory. What were their experiences, options, and attitudes when the time came to reenter the civilian world? January 21, 7PM • Navy Destroyer Operations off the coast of Vietnam in the South China Sea and in the wider Cold War in the Pacific. A Navy Chaplain, a sailor working below decks in the engine room, and a sailor manning one of the destroyer’s guns and others discussed their entry into the navy, their training and their service on destroyers. Topics included day-to-day running of the ships and life on the ships, providing Naval gunfire support to ground troops during the Easter Offensive, supporting aircraft carrier operations, tracking Soviet submarines across the Pacific, and ministering to the spiritual needs of the crews of multiple ships. One sailor mentioned his experiences with a CBS News team that was imbedded on his ship and produced a documentary based on their time on the ship. (Stay tuned for another roundtable coming soon that will highlight this in-depth.) Veterans also discussed their return to the civilian world and subsequent lives and attitudes. February 18, 7PM • Vietnam War 360. Drawing upon speakers with very different experiences, the remarks by special guests explored the war from many sides and expands on last year’s Ken Burns and Lynn Novick Vietnam War documentary. March 18, 7PM • Women Nurses in the Vietnam War. Approximately nine thousand U.S. military nurses served in Vietnam during the U.S.- Vietnam war. Though women did not serve in combat, nurses encountered the consequences of war on a daily basis as they cared for its casualties — military and civilian, American and Vietnamese. Like so many other Vietnam veterans, they struggled with their wartime experiences once they returned home. The fact that they were women veterans added another layer of difficulty to their readjustment, however. The assumption was that all veterans were men. In Minnesota, a handful of nurses who had served in Vietnam banded together as sister veterans and offered each other the help, support, and recognition that no one else had. Join Dr. Kim Heikkila for a discussion of nurses’ experiences during and after the war, with a special focus on this unique group from Minnesota. April 15, 7PM • Reporting on the War – Impact of the News Media. Don Shelby, a Vietnam War veteran who went on to become prominent news anchor in the Twin Cities, reflected on his own experiences and took a broader look at the news media’s impact on public opinion at home and the feelings of service men and women overseas. Conrad Marion Leighton worked for a year as a GI journalist in an Army combat unit, the 1st Cavalry Division, ending in August of 1971. Terry Wolkerstorfer always knew he wanted to be a journalist, but the Vietnam War turned his interests from sports to politics and foreign policy. He first served as an Army Officer and returned to Vietnam a few years later as a journalist. He learned it was an enormous undertaking to find and tell the truth in wartime. Stay tuned for the 2019-2020 Roundtable schedule!